MEG’s 232.690 was undoubtedly the star of the show, a very unusual loco to find working diverted ECs and the only loco photographed in good light in four days. 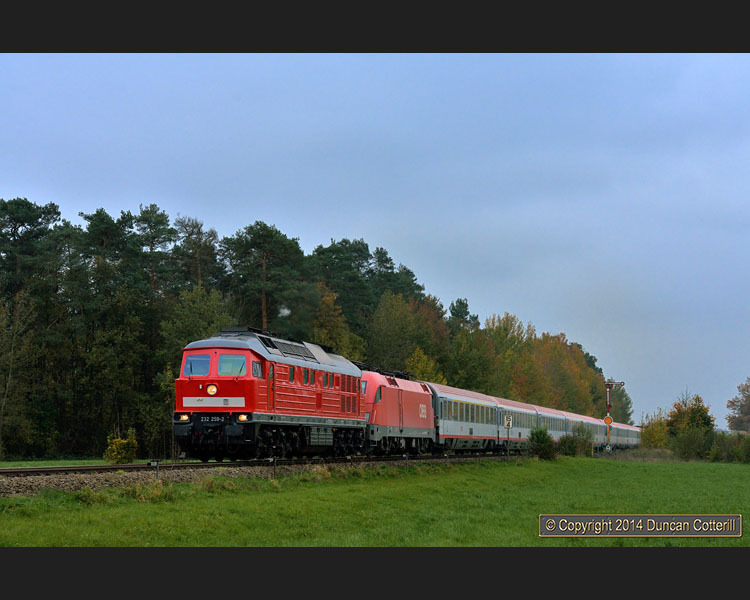 The train was EC112, the 10:27 from Klagenfurt to Frankfurt, approaching Kirchweidach on 29 October with ÖBB’s 1116.147 (front) and 1016.028 (rear) still attached. In more typical conditions, 232.259 left Garching(Alz) with EC112 on Tuesday 28 October. 1116.189 was coupled behind the diesel with 1116.034 bringing up the rear. The München – Salzburg main line was closed east of Traunstein for five days in late October 2014 to enable bridge work. During the closure a number of services were diverted while others were bustituted or simply abandoned between München and Salzburg. A few EuroCity trains ran via Mühldorf with diesel haulage, giving me a good excuse for a visit, from Sunday 26 to Wednesday 29 October. During a similar closure last year all the scheduled ECs had been diverted via Mühldorf but this time there were far fewer. In simple terms, there was an eastbound train fairly early in the morning, one each way at lunchtime and one each way mid-afternoon. A few more ran in the dark. The other daytime ECs ran normally west of München and east of Salzburg but were cancelled between the two points with no alternatives provided for intending passengers. Motive power for most of the diverted trains was a single class 232 or 234 diesel with 234.242, 232.259 and, surprisingly, MEG’s 232.690 all taking turns. Last year pairs of 218s had shared the duties equally with the 232s but this year there was only one turn for 218s, worked by 218.490 on its own on Sunday and paired with 218.489 on Monday, Tuesday and Wednesday. Both 218s were Kempten locos, unusual because it’s normally Mühldorf 218s that work ECs through Kempten, not the other way round. There seemed to be little distinction made between classes when it came to allocating locos to workings, although the 218s did work the same train, EC115, on Monday and Tuesday, they were on different trains on Sunday and Wednesday. Most trains still had their electric locos attached, a 101 at the front or the back in the case of trains formed of DB stock, or 1116s at the front and the back on trains of ÖBB stock. The exception was EC111, which was formed of diesel plus ÖBB coaches only. Timekeeping was generally reasonable except in the case of EC113, which was 80, 60, 35 and 20 minutes late on Sunday to Wednesday respectively, causing chaos to local services south of Mühldorf where passing loops are few and far between. Some of the normal passenger services around Mühldorf were observed but produced no surprises. Class 628 DMUs worked everything seen south of Mühldorf and a few trains between Mühldorf and München, while class 218 diesels on double-deck push-pull sets worked the majority of Mühldorf – München services, all as per the published diagrams. Locos 218.400, 218.401, 218.421, 218.466 and 218.498 were seen. The first four are long term Mühldorf locos but 498 appears to be a recent arrival from Frankfurt. The Mühldorf area used to be a great place to photograph freights with locos of classes 217, 225, 232 and 233 all in use on trains to and from the industries located in the “Chemical Triangle” along the rivers Inn, Alz and Salzach. In late 2010 DBS replaced the interesting locos with white sheds of class 247 or 266, depending which number you read on the loco, and I instantly lost interest. It seems that not quite everything was replaced as a train of oil tanks went west through Weidenbach behind 233.176 on the Monday morning. Three freights were seen at Weidenbach on the Tuesday morning, all hauled by 247/266s. One of these was a diversion and was seen again at Garching, almost four hours later, still waiting for a path on the single track towards Freilassing. There was another diversion on the Wednesday morning, an eastbound container train, again worked by a 247/266. Some local freight working remains in the hands of class 294s and the morning Trostberg – Garching trip was seen on Monday and Tuesday mornings behind 294.836. The same loco was seen on the afternoon working from Trostberg to Mühldorf on the Tuesday, so it looks like the timings on http://www.cargonautus.de still hold. Another regular 294 working, the afternoon “binliner” from Mühldorf to Freilassing, failed to show on Monday, Tuesday or Wednesday but that could have been linked to the line closure east of Traunstein as at least part of the load would normally have been worked west from Freilassing to Traunstein by an electric. Before the trip I thought the chance of more strikes by the German loco drivers’ union, GDL, was the main threat but the drivers remained at work and it turned out to be the weather that was the problem. The whole area was blanketed in Hochnebel, a sort of cross between fog and low cloud that can persist for days. The forecast was always that it would be nice tomorrow but it was the last day before there was any improvement. The sun broke through briefly on the Sunday afternoon, catching the last two coaches of EC115 but not the locos. Monday and Tuesday were just cold and terminally dull with no sign of a break anywhere all day. It was Wednesday before there were any substantial breaks and I got my only well lit shot in four days during the afternoon. Remarkably it was of 232.690, the MEG loco and the one I wanted the most. Photography was fairly pointless during the days of gloomy weather, producing flat lifeless pictures that didn’t do justice to the red engines, long trains and fabulous autumn colours. The Mühldorf area isn’t the most scenic in southern Germany by a long way but the gently rolling landscape is quite attractive and many stations are still semaphore signalled. There are plenty of good photo positions available, both sides of Mühldorf, but it needed decent light to make photography worthwhile and it just wasn’t there most of the time. I flew from Heathrow to München and back with British Airways and hired a car for the duration of my stay. Accommodation was at the Hotel Pfaubräu in the centre of Trostberg, a perfectly reasonable hotel in most respects with comfortable rooms and a decent restaurant but the free internet didn’t work and the bells of the church clock across the street sounded every 15 minutes day and night. As if religion hadn’t already inflicted enough suffering on the world! At least I had the opportunity to catch up on lost sleep by grabbing a few minutes kip in the car during the day, safe in the knowledge that I wasn’t missing any great shots. Sometimes trips just don’t deliver and this was one of them. At least the consolation prize was getting one shot of MEG’s 232.690 in good light. All the more reason to try again if the opportunity arises. There are still plenty of good photo locations in the area that need a long train with a red engine or two up front to bring them to life. Always assuming that the sun shines, of course.